Shaker Style Kitchen Cabinets: What Sets Them Apart? 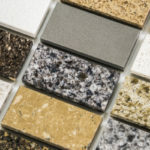 Kitchen Cabinets and Granite Countertops, Pompano Beach FL > Blog > Blog > Shaker Style Kitchen Cabinets: What Sets Them Apart? 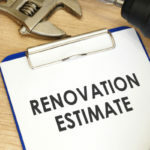 There are many different style cabinets to choose from when remodeling your kitchen, craftsman cabinets, colonial cabinets and Shaker cabinets, just to name a few. Shaker kitchen cabinets are far from new but they are showing up more frequently in modern kitchen designs. You have likely heard someone talking about ‘Shaker kitchen cabinets’ but what are ‘Shaker-cabinets’? Generally speaking, Shaker style can be identified by the appearance of a cabinet’s front door, which includes a five-piece door and a recessed center panel. Shaker design has a bit of history behind it, as it originated out of a religious movement back in the 1770s during the American colonial era. The United Society of Believers in Christ’s Second Appearing, more commonly known as Shakers, first made the distinct furniture style, hence why it’s named after their society. The Shakers made furniture that was in line with the morals of the religious sect, including simplicity, utility and honesty. As a result, the furniture they made many years ago has stood the test of time, remaining an example and classification for cabinetmaking to this day. Due to their vast purposes and superior functionality, Shaker cabinets continue to be a popular type of kitchen cabinet style, especially for modern or traditional kitchens. The core standards behind Shaker cabinets make them a wise choice for almost any kitchen. What Sets Shaker Cabinets Apart From Other High-Quality Cabinets? Here are 4 key design elements that set Shaker style cabinets apart from many other types of cabinetry. Shaker cabinets are known for their classic and simple design, which looks great in traditional or contemporary kitchens. They don’t include any fancy hardware or chunky cabinet frames. Instead, they are typically designed as flat paneled doors with rail frames, and a core focus on durable construction and high quality wood. This gives a simple, classic appeal that is built to withstand the test of time in accordance to aesthetics and durability. Woods commonly used for Shaker cabinets include durable woods like maple, quartersawn oak, hickory and cherry wood. The wood is typically found in the northeastern United States, the location of the Shaker ancestral home. Shaker cabinets often have no staining so that the natural wood finishing shows through. Since high quality wood is used this natural look can be truly beautiful. It all comes down to preference though; Shaker cabinets can also be dressed up with a natural wood finish, stain or paint. As for hardware, warm and honey colors look great paired with Shaker cabinets. It is increasingly popular for modern kitchens to include gray or white Shaker cabinets. The reason Shaker cabinets are very popular in modern kitchens has to do with straight lines and simple appeal. 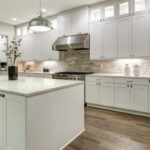 If you are planning to add stand out backsplashes, fancy countertops or other kitchen elements that really pop, Shaker cabinets offer clean, simple lines that greatly compliment other, wilder, elements of your space. 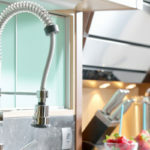 If too many elements in your kitchen stand out as unique all the great details get lost in the grand scheme of things. Good design includes some stand out elements and some elements that simply stand as the perfect background. If you use Shaker style cabinets you have the chance to go crazier when it comes to other design elements. This type of cabinetry is often referred to as a “blank slate,” because it gives you the creative freedom to go in so many different directions in regards to other elements of your kitchen. You can pay tribute to your Shaker cabinets by adding other Shaker furniture designs throughout your kitchen. If you have the budget and time you could go on the hunt for real antique Shaker furniture that has been preserved throughout the years. The true quality of Shaker furniture is proven in the fact so much of it still exists over 200 years after it was originally constructed. Still, it’s much easier and less expensive to find furniture that mimics the Shaker design but is brand new. Shaker-style cabinets are available in many different colors and look great in a large assortment of kitchens. You don’t have to buy ‘Shaker’ cabinets to enjoy the same durable quality and modern, timeless appeal, but if the aesthetics appeal to you this is a great option. Not only is this type of cabinetry built to last, but it is also built to remain in style for many years to come. Tops Kitchen Cabinet offers a vast assortment of kitchen cabinet styles at wholesale prices your budget will love.